Actea ramosa 'Black Negligee has lacy black foliage that shrouds the dark stems setting off the purple tinted, fragrant white flowers. The fragrance is like jasmine. This plant has is superb for foliage colour in the woodland garden. 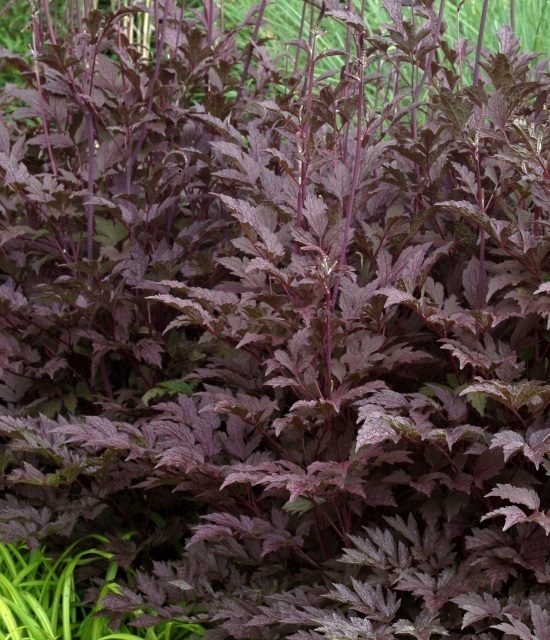 Actea 'Black Negligee' thrives in well drained soil that has been enriched with compost. It is considered a plant for partial shade but it will grow in full sun with a constant supply of moisture. It does not like competition from tree roots especially as a young plant. It is shallow rooted and easy to move so it can be dug up and reset if it is not thriving.